What's new in Java EE 7's authentication support? Java EE 7 comes with a lot of improvements in many areas. Things like JSF 2.2, CDI 1.1, JMS 2.0 and JAX-RS 2.0 have all been massively improved. However, not all specs have seen a significant revision. A number of them like JSP 2.1 and EJB 3.1 only had a minor revision, called a maintenance release. In this post we'll take a look at the changes that were done for the standardized authentication support in Java EE: JASPIC 1.1 (JSR 196). The second maintenance release of JASPIC, called Maintenance Release B officially has seen its version bumped from 1.0 to 1.1. It's sometimes confusing, but a small maintenance release can have the same version increment as a significant revision. E.g. 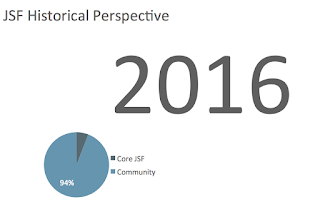 JSF 2.1 was a small maintenance release of its prior version 2.0, but EJB 3.1 was a significant revision of its prior version 3.0. One of the big hurdles when trying to register a JASPIC auth module programmatically (which incidentally is the only standardized way) for use in a Servlet app, is the fact that the API requires a so-called "AppContextID". This AppContextID has to start with a "logical host" name, but there was no standard way for code to obtain this name. In many of the proprietary (vendor specific) authentication modules that are still in use next to JASPIC you often authenticate once and the container then remembers the authentication until the user logs out, clear his cookies or when the HTTP session expires. If doValidateRequest uses the callback handler to handle a CallerPrincipalCallback constructed with the non-null principal obtained from HttpServletRequest#getUserPrincipal, and the principal was originally established using a CallerPrincipalCallback constructed with the principal name, then the groups must be restablished from the container specific principal. Hopefully a next revision of JASPIC will contain this clarification, and implementors will in the meantime do the right thing anyway. Servlet 3 introduced methods for programmatic login and logout, via the methods authenticate, login and logout on HttpServletRequest. Unfortunately JASPIC did not officially support any of these methods. All JASPIC 1.0 implementations in fact did call a SAM's validateRequest following a call to HttpServletRequest#authenticate, but the way the various vendors decided to implement the login and logout methods was particularly troublesome. Nearly all of these implementations called a completely unrelated proprietary login module following a call to login (completely ignoring any configured JASPIC SAM), while logout in most cases was completely ignored as well. JASPIC 1.1 now mandates implementations to make sure that forwarding & including via a RequestDispatcher works as expected. Finally, the JASPIC 1.1 spec document contains some clarifications for what e.g. "after the service invocation" means and corrected an inconsistency in the formal JavaDocs. While these small changes may not seem as exciting as those done for the specs that got a major revision, it's still a great step forward and addresses some very real pain points that existed in JASPIC 1.0. A very convenient full list of what was changed in JASPIC 1.1 with links to the diffs in the spec and associated JIRA issues can be found at the JCP site. Hi Arjan, after reading your "Implementing container authentication in Java EE with JASPIC" this post filled some of the missing pieces. Thank you! I was under the impression that the role-group mapping would be optional in EE7/Glassfish 4. But it still seems to be required. Also what do you mean by "semi-remember the authentication"? Is the principal not maintained throughout the session? >I was under the impression that the role-group mapping would be optional in EE7/Glassfish 4. But it still seems to be required. >Also what do you mean by "semi-remember the authentication"? Is the principal not maintained throughout the session? The principal is maintained (remembered), but it's not automatically applied the next request. After asking for the principal to be remembered, GlassFish will call the validateRequest the following method again and if you do nothing, the principal will simply not be available during that request. Instead, you have to explicitly tell JASPIC that you want it to use the previously remembered principal (and roles). Since JASPIC has a very minimal API, you can't just say something like "container.useRememberedIdentity()", but instead you have to execute the "protocol" as given in the article. Is cleanSubject also responsible for modifying the messageinfo to remove any authentication tokens from cookies or header for example? Yes, that's the idea indeed. A SAM that implements a remember me function can use that method to remove a remember me cookie.